So I went in and just randomly picked up a few items (making sure they added up to over €40 so I could get the free gift, which was not worth it but we'll talk about that another time) I went straight to the Vitamin E range because I had read so many good reviews about it however I hadn't a clue what to actually pick up because at that very moment I could not think of one single product I had read about! During that visit I ended up picking up the Facial Mist and the Toner because they're pretty basic things to have in your routine so I knew that I would use them. Now while I hoard skincare products sometimes it takes me quite a while to actually use them because as soon as I start changing up my routine my skin tends to break out due to the change. However for the first time ever I added both products straight away to my routine and used them religiously every day and my skin didn't break out over the change at all. Starting with the Facial Mist as it was the first thing I picked up. Firstly let's get this out of the way, the prices of these products were ridiculous like I've never paid so much money on skincare before but sure, treat yo'self and all that! Before trying the Body Shops Facial mist I had been using the Botanics version and it is so lovely! I won't lie when I say that they both do the exact same thing and I don't find one is better than the other, they even smell the same! Although I haven't really looked into the ingredients to see if they are very similar but although I do like the Body Shop one I do feel like there are just as good cheaper alternatives that do the same job. However I haven't used my botanics one since I bought the Body Shops one so maybe that does say something...who knows. Next the toner! I hadn't had a toner in my routine in the longest time so that's why I decided to pick this up (plus they didn't have the cleanser in stock which was why I got this instead) Toners I had used in the past have been like water, that's the easiest way I could describe them, however this one while it still pours easily it almost has a Gel finish to it which I've become quickly obsessed with. It leaves my face feeling so refreshed after using it and because of the Gel like texture I find that a little goes a long way. I've been using this religiously Morning and Night and my god I honestly cannot recommend it enough!! Then after buying those two and trying them for three days I went to a local pharmacy who stocks a small amount of the range and finally got my hands on the cleanser. The cleanser is so luxurious I actually cannot say enough about it. It feels so beyond refreshing and leaves your skin feeling so clean I just love it. Also I have to mention the pretty pink packaging, I mean could a skincare product get anymore instagrammable!? I also decided to pick up the overnight serum in oil as at the time I had wanted to pick up a new serum and one for night time suited me perfectly because it's when I slather everything on my skin! Now usually I don't like oily products as I just really dislike the feeling and even the texture of it. But I don't actually mind this one, it absorbs into the skin quite quickly and easily and when you wake up in the morning there's no gross oily leftover feeling on your skin which I'm all about! I can't believe it took me so long to try the range but oh my god I basically want to buy everything from it now! 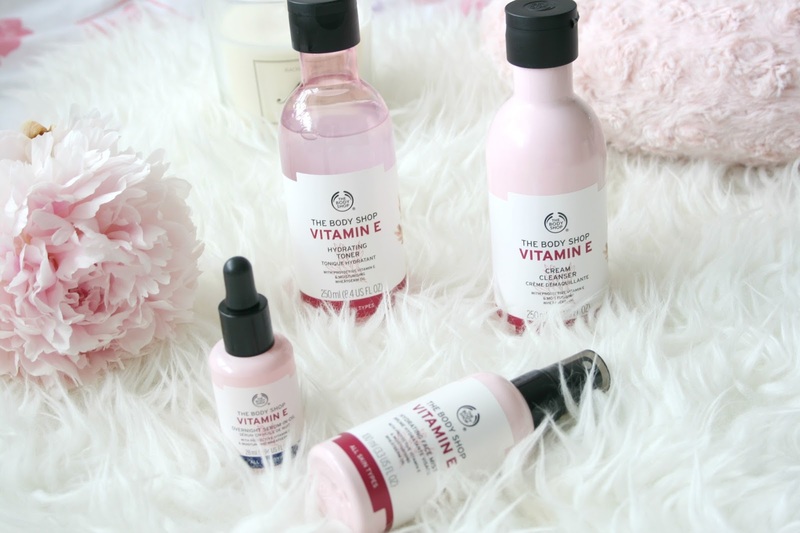 Have you tried The Body Shops Vitamin E range yet? I love this range, its a saviour for my skin in winter when I go all dry!